Posted by Carmen Guedez Admin. The pioneers of modern art unlocked artistic production for any kind of artist to be able to find a niche where she could deliver any kind of message in any preferred style or medium. And, since the end of the Modern era (1970s), so many new art products, materials and design tools have landed in our hands, artists have only their muses to blame for a lack of creative productivity. Released from its mandate to churn out formalised and sanitised grand art until the end of the 19th century, the beginning of modernism in art brought to the artist freedom never seen before. The disciplines of illustration and commercial design gained credibility and popularity as the 20th century progressed until today, art and illustration are mostly indistinguishable in the minds of most. Modern Art is categorized by art historians as that art produced between 1860 and 1970: a period of intense social, political and technological changes. It is characterised by abstraction, new materials and ideas about the nature of art. Early in this time we find Gauguin drawing inspiration from Japanese prints. This enabled him to experiment with flatness, and new approach to line-making. Gauguin’s travels to the Philippines exposed him to new atmospheric light, a new life-style, a new set of beliefs which gave rise to his rich and delicious saturated paintings. The Expressionists looked to the human soul for inspiration, and leaning on colour and distortion for expression, began to stun the art critics with raw, rough images with saturated colour and bestial energy. A new influx of what they thought of as ‘primitive’ artifacts from the new world gave them a license to explore emotion more bravely, linking it to a new discipline in psychology as Freud began to become better known. The Futurists looked at increasing industrialisation and mechanisation and saw new values arising. They painted speed, dynamism, movement, repetition. Art Deco, more a style in architecture and illustrative design, also took the western world by storm. It found new ways to articulate facades, changed the classical proportions of living spaces, and brought a feminine elegance to public environments. Posters, newspapers and books were festooned with Art Deco flourishes and the revival of dark and mystical folk-lore themes. New techniques in stained glass, ceramics and architecture meant that more novel things were being made, being bought and being used. The government-supported economic boom of the 1920s resulted in thousands of Art Deco artisans being engaged to decorate buildings that were erected during that time, to the degree that some you can only ever see from the top deck of a bus as you tour the streets of New York. After comic-books had become popularised during the 1950s cementing new heroic American archetypes in the minds of the American public, artists noticed that the general public no longer took the trouble to understand art, and simply preferred things that were new, bright and simple. 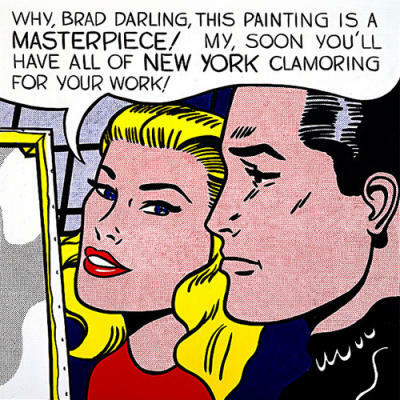 Pop Artists began a campaign of both pointing out the shallowness of this new tendency in the public, while at the same time raising the visual style of the comic-book to the status of high art. Pop artists took the simple, slick style of TV and comics and blew them up to phenomenal scale to draw attention to their social commentary and the shallowness of the genre. As they predicted, the public went wild for the accessible style and shininess. These pioneers of 20th century imaging have left us a legacy of inspiration right in our living environments. Weary of the grandiose mythological, religious and political subject matter of the previous years, they have allowed art to reflect the every-day lives of ordinary people. This means you could legitimately find inspiration in your kitchen, on your commute to work, or on your next vacation. If a human being can experience it, it’s valid subject matter for art. All you have to do is keep your eyes and mind open to find things that are interesting and meaningful. Travel – paint the people, paint the flowers and landscapes, buy mementos made by locals. Look at what artists are doing in other parts of the world – like Japan. Illustrate your favourite fairy-tale or cultural myth. Buy a comic you don’t normally read and design your own superhero or super-villain. Visit an art gallery and look at some 20th Century art. Choose some colours that resonate with your mood and do a quick abstract painting to illustrate how you feel. Take a small thing and make a huge painting of it. This article was written by Caroline Magget. Official Site of Carmen Guedez. Copyright © 2009-2019 CG Modern Art LLC. All rights reserved. Raleigh, NC - US.